bDepartment of Health Sciences Research (R.K.L., R.E.C. ), Mayo Clinic, Rochester, Minnesota. BACKGROUND AND PURPOSE: Because intramedullary spinal cord metastasis is often a difficult diagnosis to make, our purpose was to perform a systematic review of the MR imaging and relevant baseline clinical features of intramedullary spinal cord metastases in a large series. MATERIALS AND METHODS: Consecutive patients with intramedullary spinal cord metastasis with available pretreatment digital MR imaging examinations were identified. The MR imaging examination(s) for each patient was reviewed by 2 neuroradiologists for various imaging characteristics. Relevant clinical data were obtained. RESULTS: Forty-nine patients had 70 intramedullary spinal cord metastases, with 10 (20%) having multiple intramedullary spinal cord metastases; 8% (4/49) were asymptomatic. Primary tumor diagnosis was preceded by intramedullary spinal cord metastasis presentation in 20% (10/49) and by intramedullary spinal cord metastasis diagnosis in 10% (5/49); 98% (63/64) of intramedullary spinal cord metastases enhanced. Cord edema was extensive: mean, 4.5 segments, 3.6-fold larger than enhancing lesion, and ≥3 segments in 54% (37/69). Intratumoral cystic change was seen in 3% (2/70) and hemorrhage in 1% (1/70); 59% (29/49) of reference MR imaging examinations displayed other CNS or spinal (non–spinal cord) metastases, and 59% (29/49) exhibited the primary tumor/non-CNS metastases, with 88% (43/49) displaying ≥1 finding and 31% (15/49) displaying both findings. Patients with solitary intramedullary spinal cord metastasis were less likely than those with multiple intramedullary spinal cord metastases to have other CNS or spinal (non–spinal cord) metastases on the reference MR imaging (20/39 [51%] versus 9/10 [90%], respectively; P = .0263). CONCLUSIONS: Lack of known primary malignancy or spinal cord symptoms should not discourage consideration of intramedullary spinal cord metastasis. Enhancement and extensive edema for lesion size (often ≥3 segments) are typical for intramedullary spinal cord metastasis. Presence of cystic change/hemorrhage makes intramedullary spinal cord metastasis unlikely. Evidence for other CNS or spinal (non–spinal cord) metastases and the primary tumor/non-CNS metastases are common. The prevalence of other CNS or spinal (non–spinal cord) metastases in those with multiple intramedullary spinal cord metastases is especially high. Intramedullary spinal cord metastasis is uncommon, with a prevalence of up to 2.1% in autopsy series of patients with cancer.1 Yet, ISCMs are being increasingly diagnosed, related to advances and increased use of imaging and therapies that prolong survival in patients with cancer.2–6 Prompt and accurate diagnosis of ISCM is necessary for effective treatment, and MR imaging is the preferred imaging technique.5 Despite this, large series systematically evaluating multiple MR imaging features of these masses have not been published. The literature on ISCM is limited to case reports, relatively small case series, literature reviews, and autopsy series. Because ISCM is often a difficult diagnosis to make, the purpose of this retrospective study was to perform a systematic review of the MR imaging and relevant baseline clinical features of ISCMs in a large series. Institutional review board approval with waived consent was obtained for this Health Insurance Portability and Accountability Act–compliant retrospective research study. Two radiologists reviewed all MR imaging examinations in consensus at an electronic workstation (one [F.E.D.] a neuroradiology faculty member with American Board of Radiology certification, a Certificate of Added Qualification in neuroradiology, and in full-time neuroradiology practice, and the other [J.B.R.] a neuroradiology fellow with American Board of Radiology certification). The MR imaging examinations were predominantly from our institution but did include some from outside facilities. All available pulse sequences were reviewed. The typical examination included sagittal T1- and T2-weighted, axial T2-weighted, and postgadolinium sagittal and axial T1-weighted images. The presence or absence of the following imaging features was analyzed, by use of pregadolinium and postgadolinium T1-weighted images: 1) number of ISCMs per patient, and for each ISCM: 2) location (cervical, cervicothoracic, thoracic, thoracic-conus, conus), 3) position within the cord on axial images (central, eccentric, exophytic), 4) morphology (well-circumscribed versus ill-defined), and cord expansion (absent versus present), 5) T2 signal intensity (hyperintense, hypointense, or isointense to the spinal cord), 6) T1 signal intensity (hyperintense, hypointense, or isointense to the spinal cord), 7) convincing evidence of cystic change (nonenhancing fluid signal on T1- and T2-weighted images; rated as absent, or if present, intratumoral, peritumoral, or both), 8) convincing evidence of intratumoral hemorrhage (nonenhancing T1 hyperintensity and/or marked T1 hypointensity and corresponding T2 hypointensity and/or “blooming” magnetic susceptibility artifact on gradient recalled-echo sequences, if available; rated as absent versus present), 9) gadolinium enhancement (absent or, if present, homogeneous versus heterogeneous versus peripheral [ring]), 10) maximal size of enhancing lesion in millimeters (measured anteroposterior, transverse [axial images required], and superior-inferior), 11) maximal longitudinal extent of enhancing lesion in number of vertebral segments, and 12) maximal longitudinal extent of spinal cord T2 hyperintensity in number of vertebral segments (sagittal T2 images required). The ratio of length of spinal cord T2 hyperintensity to length of ISCM was calculated for each lesion. For the per-patient T2 signal extent in patients with multiple ISCMs, the length of the longest lesion was considered. By including lesions that appeared eccentric or exophytic, it is possible that both primary intramedullary metastases and leptomeningeal metastasis invading the spinal cord would be included among ISCMs. Thus, eccentric/exophytic lesions were further characterized as either clearly intramedullary or possibly of leptomeningeal origin with spinal cord invasion, on the basis of which was dominant, the intramedullary or the cord surface component. In addition, for the exophytic lesions: 1) original MR imaging reports were reviewed to assess whether the interpreting radiologist described an intramedullary mass with exophytic extension or a leptomeningeal mass with invasion, and 2) previous categorization of “rim” and “flame” signs,7 two postgadolinium MR imaging findings specific for ISCM, was noted. Note also that leptomeningeal lesions without an apparent intramedullary component were not considered to be ISCMs. For each patient, the reference spinal MR imaging was reviewed for evidence of the primary tumor and/or extraspinal, non-CNS metastases. The reference spinal MR imaging as well as any other electronically available MR imaging of the neuroaxis performed within 4 weeks before or 4 weeks after the reference MR imaging were reviewed by the 2 radiologists for any evidence of other spinal column or CNS metastases not involving the spinal cord (including vertebral column, leptomeningeal, and visualized intracranial contents). Leptomeningeal metastases were localized anatomically as involving the spinal cord/conus, the cauda equina, the cul-de-sac, or any combination of these. Any available spinal MR imaging examinations subsequent to the reference MR imaging were also reviewed for development of additional ISCMs. The electronic medical records of each patient with ISCM were reviewed. The primary tumor type for each patient was noted. The clinical presentation was recorded (asymptomatic or if symptomatic: weakness, sensory symptoms, pain, bowel and/or bladder dysfunction, and duration of these symptoms in weeks). Of these symptoms, when possible, the dominant presenting clinical symptom that led to the spine MR imaging was determined. The dates of the primary tumor diagnosis, ISCM clinical presentation, and ISCM diagnosis were identified. Two intervals were calculated: primary tumor diagnosis to ISCM clinical presentation and primary tumor diagnosis to ISCM diagnosis. The association between solitary versus multiple ISCMs status and the following variables was analyzed by means of χ2 test: primary tumor type and presence on reference MR imaging of 1) other CNS or spinal (non–spinal cord) metastases, 2) primary tumor/non-CNS metastases, or 3) specifically, leptomeningeal metastases. Descriptive statistics were obtained by use of Excel 2010 (Microsoft, Redmond, Washington). Additional analyses were conducted by using SAS version 9.3 (SAS Institute, Cary, North Carolina). Statistical significance was defined by a P value of <.05. Of the 49 patients with 70 ISCMs, 26 (53%) were female, with a median age of 57.7 years at diagnosis (range, 7–80 years). Histopathologies of the primary malignancies in the 49 patients are shown in Table 1. Regarding the category of “other,” 1 of each of the following primary tumor types were represented, for a total of 6 (12%) patients with 6 (9%) ISCMs: anaplastic thyroid carcinoma, salivary ductal carcinoma, neuroendocrine carcinoma, ovarian adenocarcinoma, lymphoma, and prostate carcinoma. The nature of the CNS-origin primaries in 4 patients is as described in the prior study.7 Solitary versus multiple ISCMs status did not correlate with tumor type (P = .1607), but the 10 cases of multiple ISCMs only occurred with the 2 most common primary malignancies: lung cancer (7/10, 70%) and breast cancer (3/10, 30%). Table 1 includes additional relevant clinical features of the patients with ISCM. Patients had a median of 2 weeks of symptoms at clinical presentation. The most common presenting symptom was weakness (28/49, 57% of patients). However, several patients were asymptomatic with regard to the ISCM (4/49, 8% of patients); one-half (2/4) of these asymptomatic patients had multiple ISCMs (Fig 1). A diagnosis of primary malignancy was not always known at the time of reference MR imaging, as the clinical presentation of the ISCM preceded primary tumor diagnosis in 20% (10/49) of patients, with the actual diagnosis of ISCM preceding primary tumor diagnosis in 50% (5/10) of these patients. In all (10/10) of the patients with multiple ISCMs, the diagnosis of the primary malignancy preceded the ISCM diagnosis. Multiple intramedullary spinal cord metastases in an asymptomatic patient. A 73-year-old man with a history of metastatic lung adenocarcinoma underwent a spine MR imaging after a PET-CT scan had demonstrated multifocal spinal hypermetabolism. He was asymptomatic with regard to the spinal cord. 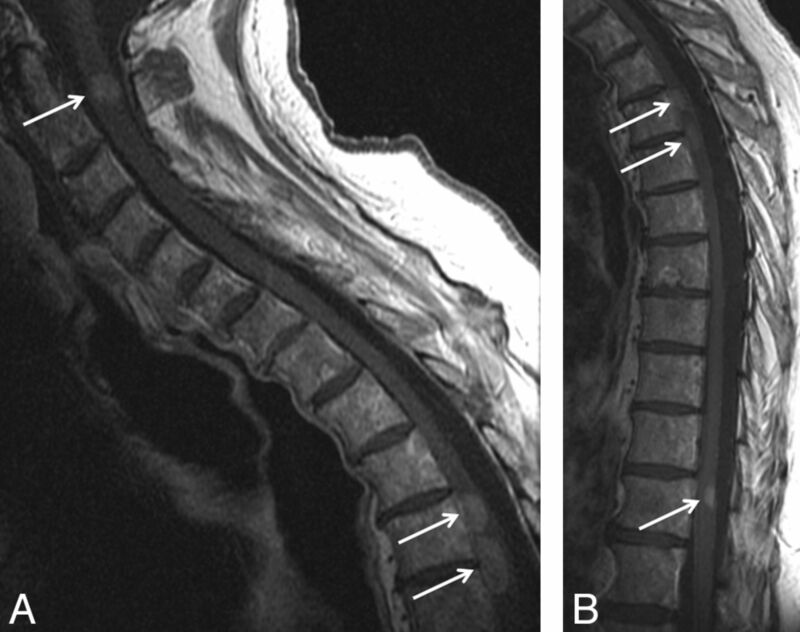 Postcontrast sagittal T1-weighted images of the cervical (A) and thoracic (B) spine are shown. Multiple intramedullary spinal cord metastases are demonstrated at the C2, T4, T4–5, and T11 levels (arrows in A, B). In this series, several other patients were asymptomatic. Thirty-nine (80%) of 49 patients had solitary ISCM on the reference MR imaging (Fig 2), whereas 10 (20%) of 49 had multiple ISCMs (31 additional ISCMs for a mean of 3 ISCMs per patient; Figs 1 and 3). The MR imaging features of the ISCMs on reference MR imaging on a per-lesion basis are detailed in Table 2. Note that most of the lesions were solitary (39/70, 56%), in the thoracic spinal cord (40/70, 57%), eccentrically located within the cord (35/62, 56%), expanding the cord (44/70, 63%), enhancing (63/64, 98%), T2-hyperintense relative to the cord (55/70, 79%), and T1-isointense relative to the cord (48/63, 76%). The length of cord T2 signal abnormality was often extensive (mean, 4.5 segments), on average 3.6-fold greater than the length of the enhancing lesion, extending ≥2 segments in 62% of lesions (43/69) and 75% of patients (36/48) and ≥3 segments in 54% of lesions (37/69) and 67% of patients (32/48). Typical solitary intramedullary spinal cord metastasis, with visualization of primary tumor. A 66-year-old man presented with 6 weeks of paresthesias, bladder dysfunction, lower extremity weakness, and pain. Thoracic spine sagittal T2-weighted (A), sagittal T1-weighted (B), postcontrast sagittal T1-weighted (C), and axial T1-weighted (D) images are shown. A T2 hyperintense, expansile intramedullary cord lesion (arrow) is associated with a large amount of cord T2 hyperintensity (A). The mass is isointense on T1-weighted images (arrow in B) and enhances heterogeneously (arrow in C). Also noted is a left hilar lung mass (arrows in D), which was further evaluated with chest CT imaging (not shown). This hilar mass was pathologically proved to be a grade 4 undifferentiated small-cell lung carcinoma. Visualization on MR imaging of the primary tumor/non-CNS metastases and/or other spinal/CNS (non–spinal cord) metastases was common in this series. Multiple intramedullary spinal cord metastases, with visualization of other CNS metastases. A 60-year-old woman with a history of small-cell lung carcinoma, diagnosed 6.5 months prior, presented with several days of lower extremity weakness and urinary and stool incontinence. 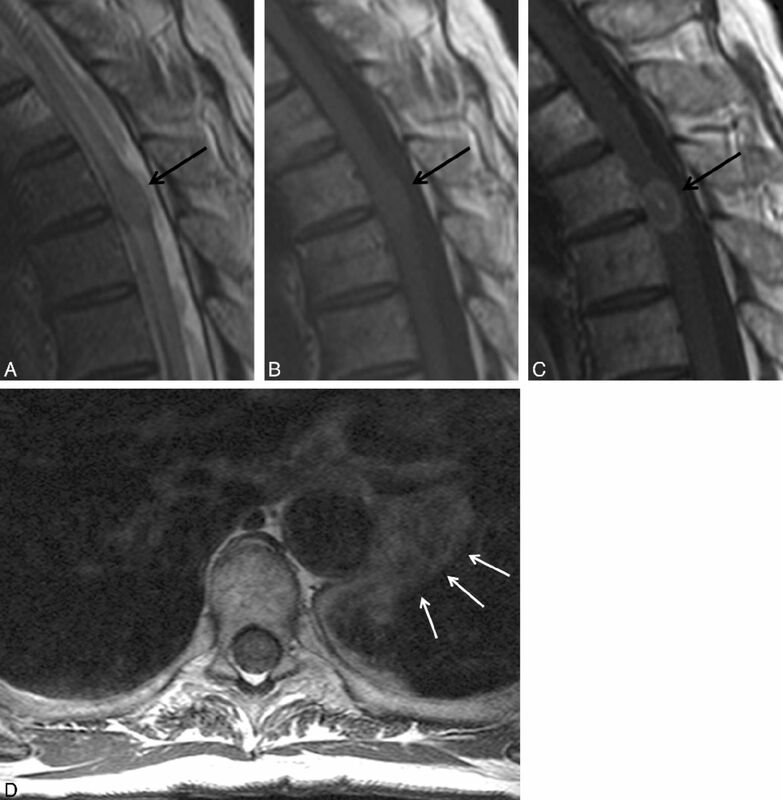 MR images of the cervical and thoracic spine with postcontrast fat-saturated consecutive sagittal T1-weighted images of the thoracic spine (A, B, C) and postcontrast sagittal T1-weighted image of the cervical spine (D) are shown. Several enhancing intramedullary lesions are present (white arrows in A, B, D). There is abnormal leptomeningeal enhancement with several small metastases studding the surface of the cord (arrows in C). Metastases are visualized in the lower pons and cerebellum (thick white arrows in D). Visualization on MR imaging of other CNS or spinal (non-spinal cord) metastases was common in this series, and more common in patients with multiple ISCMs. Most lesions appeared convincingly of intramedullary origin rather than leptomeningeal with spinal cord invasion. Specifically, only 4 lesions were exophytic. One of these 4 cases demonstrated the “rim” sign and one both the “rim” and “flame” signs, specific signs previously described in ISCMs.7 In all 4 cases, the interpreting radiologist described an intramedullary mass with exophytic extension, not a leptomeningeal mass with parenchymal invasion. Of the 39 lesions that were characterized as being either eccentric in the spinal cord (n = 35) or exophytic (n = 4), only 3 lesions (4% of all 70 ISCMs, 6% of the 62 ISCMs for which axial images were available) appeared to potentially be of leptomeningeal origin, given a dominant surface component, rather than originating within the spinal cord. Two of these 3 lesions occurred in the same patient. Two findings were rare. Central cystic or necrotic change was seen in only 2 of the ISCMs (2/70, 3%) (Fig 4), with only 1 of these 2 lesions demonstrating ring enhancement peripherally about the cystic change. Only 1 lesion demonstrated convincing evidence for associated hemorrhage (1/70, 1%) (Fig 5). Atypical intramedullary spinal cord metastasis with central cystic change/necrosis. A 55-year-old man with recent nephrectomy of a renal cell carcinoma presented with 2 weeks of predominantly left upper extremity pain, paresthesias, and weakness, as well as global hyperreflexia. 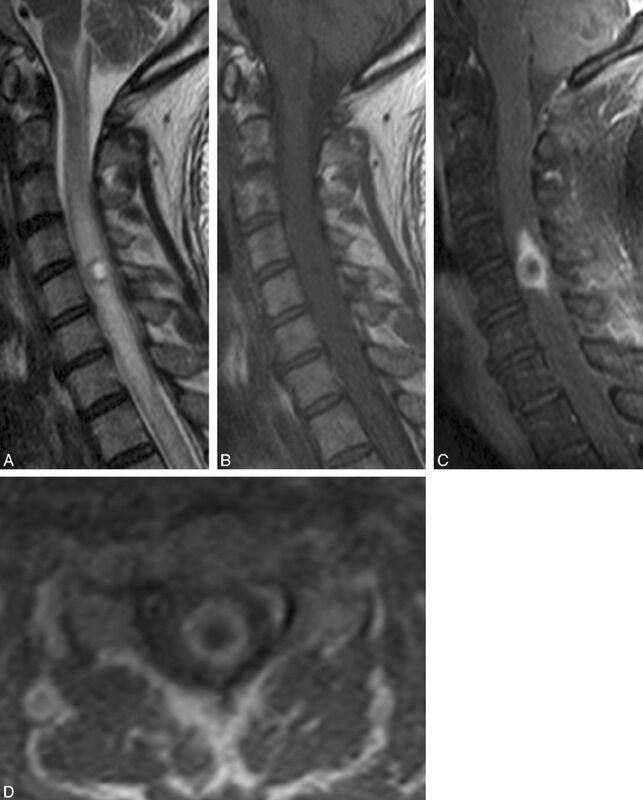 Cervical spine sagittal T2-weighted (A), T1-weighted (B), and postcontrast fat-saturated T1-weighted images (C), and postcontrast axial T1-weighted image are shown. A mass within the cord at the level of C5 has markedly hyperintense central signal on T2-weighted imaging (A) and corresponding T1 hypointensity (B) consistent with central cystic change/necrosis. The sagittal (C) and axial (D) T1-weighted postcontrast images demonstrate the peripheral enhancement with lack of central enhancement corresponding to the region of central cystic/necrotic change. This represents 1 of only 2 cases in the current series of intramedullary spinal cord metastasis demonstrating cystic/necrotic change. The primary tumor type in the other case (not shown) was lung carcinoma. Atypical intramedullary spinal cord metastasis with associated hemorrhage. A 74-year-old man with squamous cell carcinoma of the lung diagnosed 2 years prior presented with 4 weeks of paraplegia. Thoracic spine shown with sagittal T1-weighted (A) and T2-weighted (B) and axial gradient recalled-echo (C) images. Heterogeneous mildly hyperintense central signal is present within the intramedullary spinal cord metastasis on T1-weighted imaging (arrows in A). There is corresponding heterogeneity on T2-weighted imaging (B). The axial gradient recalled-echo image demonstrates corresponding central hypointensity (“blooming,” arrow in C), typical of hemorrhage. This is the only intramedullary spinal cord metastasis in the current series demonstrating signal changes convincing for associated hemorrhage. Table 3 includes additional findings on the reference MR imaging on a per-patient basis. Note that most patients (43/49, 88%) had additional CNS or spinal column metastasis(or metastases) not involving the spinal cord and/or the primary tumor or non-CNS metastasis(or metastases) visible on the reference MR imaging (Fig 2D; Fig 3C,-D). In other words, only in a minority of patients (6/49, 12%) did the MR imaging not demonstrate at least 1 of these associated findings. When leptomeningeal metastases were present (18/49, 37% of patients) on reference MR imaging, they most commonly manifested as diffuse involvement along the cord/conus, cauda equina and cul-de-sac (8/18, 44%); isolated involvement of the cul-de-sac did not occur. Patients with solitary compared with multiple ISCMs were less likely to have CNS/spinal (non–spinal cord) metastases on the reference MR imaging (20/39 [51%] versus 9/10 [90%], respectively; P = .0263). There was no correlation between solitary versus multiple ISCMs status and presence of either primary tumor/non-CNS metastasis or leptomeningeal metastases on reference MR imaging (P = .3484 and P = .872, respectively). Forty-seven percent of patients (23/49) had evidence of other CNS/spinal metastases (non–spinal cord) on MR imaging examination(s) of the neuroaxis obtained within the 4 weeks preceding the reference MR imaging. An additional 16% of patients (8/49) demonstrated such other metastases within the 4 weeks subsequent to the reference MR imaging. The subsequent development of a new ISCM on follow-up MR imaging occurred in 22% (11/49) of patients. The current study highlights several relevant clinical and MR imaging features of ISCMs in a large series of patients. The most salient clinical features of ISCM are 1) lung cancer is the most common primary tumor, 2) the primary malignancy has not always been diagnosed at the time of ISCM symptom onset or reference MR imaging, and 3) patients can be asymptomatic with regard to the ISCM, even in the case of multiple ISCMs. The 3 most pertinent imaging features of ISCMs are 1) almost all ISCMs enhance, 2) the associated spinal cord T2 hyperintensity is extensive, and 3) both intratumoral hemorrhage and intra-/peritumoral cystic/necrotic change are rare. An additional important imaging finding is that either additional CNS/spinal (non–spinal cord) metastases or the primary tumor/non-CNS metastases are extremely common, seen in nearly 90% of patients in this series on the reference MR imaging. The prevalence of other CNS/spinal (non–spinal cord) metastases in those with multiple ISCMs is especially high. Knowledge of these relevant clinical and imaging features of ISCM and their significance is important for radiologists and the referring clinicians. When faced with a spinal cord mass, lack of a known primary malignancy and lack of symptoms related to the mass should not dissuade one from considering an ISCM. For any spinal cord mass, but particularly when ISCM is strongly considered, the visualized lungs should be scrutinized because lung cancer is the most common primary malignancy. Lack of enhancement and presence of cystic change and/or hemorrhage in an intramedullary mass should bring other etiologies of spinal cord masses higher in the differential diagnosis, such as primary cord neoplasms, in which such findings are not uncommon. The radiologist should scrutinize the MR imaging as well as other prior neuroaxis imaging studies for presence of other CNS/spinal (non–spinal cord) metastases and the primary tumor/non-CNS metastases. The presence of additional ISCMs should be specifically sought. 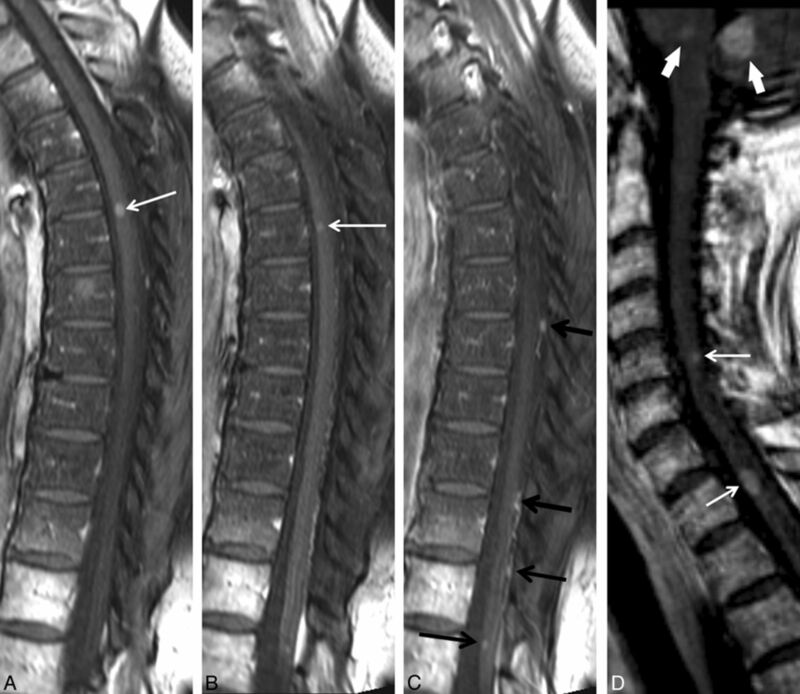 The large amount of spinal cord edema compared with the length of the enhancing ISCM has been known anecdotally and described in a smaller series with low field strength MR imaging examinations,10 as well as in other small series; for instance, in 3 patients in a study by Sze et al.11 However, to our knowledge, this has not been systematically reported and quantified in a large series by use of modern MR imaging scanners. Other studies, including the recent comprehensive literature review by Sung et al,9 have also found that lung cancer accounts for approximately 50% of ISCM cases and that breast cancer is the second most common primary malignancy. The review by Sung et al also found a high frequency of systemic metastases, though our present study examined this specifically on the basis of what a radiologist might visualize on the reference MR imaging. Additional similarities between our series and the review by Sung et al, respectively, are: propensity for ISCM to be solitary (80% versus 88% prevalence), age (wide range, with median 58 years versus 56 years), weakness as the most common symptom (57% versus 88%), symptom duration (wide range, with median of 2 weeks versus 3 weeks), frequency of asymptomatic patients (8% versus 5%), ISCM preceding primary tumor diagnosis (“synchronous presentation”) (20% versus 26%), and interval between primary tumor diagnosis and ISCM diagnosis (wide range, with median of 19 months versus 16 months). Differences between our series and the review by Sung et al, respectively, are: prevalence of sensory symptoms (16% versus 73%) and prevalence of bowel/bladder dysfunction (10% versus 43%). These discrepancies may exist because we only assessed symptoms up to the time of the MR imaging, not for the remainder of the disease course. An additional difference between our series versus the comprehensive literature review by Sung et al, respectively, is the prevalence of thoracic ISCM (57% versus 34%). This discrepancy is probably multifactorial. For instance, our anatomic categorization was based exclusively on MR imaging (rather than autopsy) findings. Moreover, we did not include patients with “intramedullary” metastases exclusive to the cauda equina (not involving the spinal cord and presumably leptomeningeal), which may account for the relatively higher proportion of “lumbar” spinal cord metastases (38%) seen in literature reviewed by Sung et al. As for the development of ISCMs, several pathophysiologic mechanisms have been described, including arterial spread, retrograde venous spread (via Batson venous plexus), meningeal spread, perineural lymphatic spread, and direct invasion from a contiguous structure.4,8,13,15,16 Of these proposed mechanisms for the pathogenesis of ISCMs, spread via the arterial route is generally favored as the most common, though the mechanism may differ, depending on the primary tumor cell type. The preponderance of central and eccentric ISCMs in the present study and the relative lack of exophytic ISCMs also suggest that the arterial route is a more common means of spread, particularly given the robust arterial supply to the central gray matter of the cord. However, a case series encompassing all types of spinal cord metastases, ideally with microscopic pathologic correlation, would be needed to confidently achieve this conclusion. Inclusion of CSF analysis would also be potentially useful. Limitations of this study include its retrospective nature, the use of consensus imaging review, and the lack of uniformity of MR imaging technique, because not all of the examinations were from our institution. Although our series is the largest published single institution study of patients with ISCM, the relatively small sample size remains a limitation. Only 10% of the 49 patients had pathologic confirmation. However, this is consistent with the other smaller published series of ISCM, because pathologic sampling from surgery/autopsy is typically not obtained. Moreover, the multiple aforementioned clinical features in the current study that were similar to published literature suggest that the patients in our series are indeed representative of patients with ISCMs. The most common reason for biopsy or resection of ISCM is for diagnostic purposes3,7,9; knowledge of the results of the current study, as well as of the recently described enhancement characteristics specific for ISCM,7 is anticipated to decrease such diagnostic surgery rates. We describe pertinent clinical and MR imaging features in a large series of patients with ISCM. When considering ISCM in the differential diagnosis of a spinal cord mass on MR imaging, the results of this study should be helpful to radiologists. Absence of clinical symptoms and lack of a known primary malignancy should not dissuade one from considering ISCM. Presence of cystic change or hemorrhage should cause one to entertain other diagnostic possibilities as more likely. Extensive edema compared with enhancing lesion size is typical. Evidence for other CNS or spinal (non–spinal cord) metastases, the primary tumor, and non-CNS metastases should be sought because these features are common. The prevalence of other CNS or spinal (non–spinal cord) metastases in those with multiple ISCMs is especially high. Paper previously presented at: Annual Meeting of the American Society of Neuroradiology, the ASNR 50th Annual Meeting, April 2012; New York, New York. Accepted after revision January 12, 2013. Clinical Reasoning: An unusual cause of transverse myelitis?